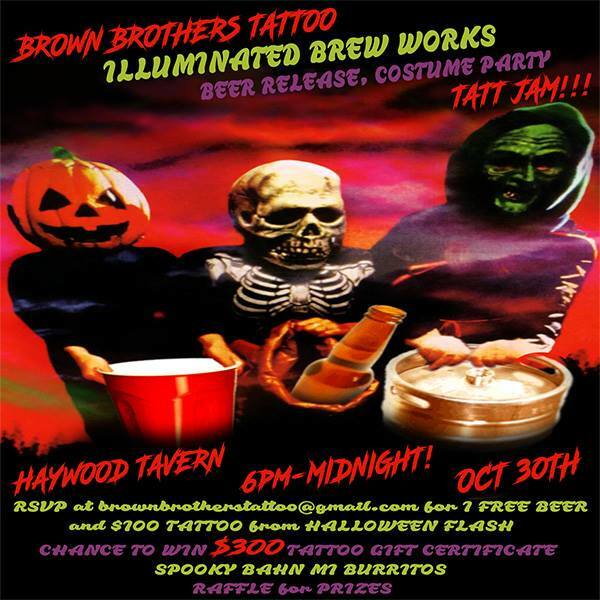 Halloween with IBW, Haywood & Brown Brothers Tattoos! This coming Monday, October 30th come celebrate Halloween with Illuminated Brew Works, Haywood Tavern & Brown Brother's Tattoos. IBW will be debuting our new collaboration with the Haywood Tavern (6.5% Farmhouse with Peaches) and a new collab with Brown Brothers Tattoo (Session Rye Ale Dry Hopped with Simcoe). We'll also be pouring War Goat (Dry Hopped Farmhouse) and a very rare appearance of Dogon Death Mask (barrel fermented Flanders Red) on draft! Costume contests, cheap tattoos, raffles, and enough booze to ruin your Tuesday AND your Wednesday. Here's the Facebook link if you need something like that. We will still love you, but we will think less of you if you miss this.